It's crazy to think a little over a year ago I started this little project called Dancers of RVA (doRVA). As I write this tonight, stacked on my desk is a series of objects I leave out to remind me that I am creating with purpose and with my why always in mind. I am looking the cover of THE GRID magazine's spring edition, featuring the Dancers of RVA with a beautiful write up about my love for photography and how doRVA came to life. I am so very thankful for Paul Spicer for seeing something special in doRVA and giving it a voice to know more of the RVA community. There is a poster from RADAR Dance Company from when we collaborated for their show IMPETUS. This poster always makes me smile and realize how I had the opportunity to work one on one with everyone in their company, talk about blessed! Also, piled high at the center of everything, I am looking at my calendar and pages of notes leading up to my very first photography exhibit that will feature the first year of Dancers of RVA! I could go on and on about my desk momentos, maybe that will be a post for another time. I just can't believe it's only year one and I seriously am so tickled & happy to know that people love and are invested in our dancers' stories, they are inspired. This inspires me. I don't know if I have ever shared with you how this project really began. I know I have always shared the story of doRVA's birth with all my dancers, but never with all of you. Well, if you don't mind sticking with me, I would like to share. Before I go into the details of how doRVA was birthed, I think it's important to share in 2015 I read a book called Big Magic by Elizabeth Gilbert. That book single handily changed how I chose to create and live a creative life. I often times wonder if I hadn't read this book if I would have followed my heart to start this project and collaborate without the fear of what if's. Before moving to Richmond in 2016, I lived in the Tampa Bay area in Florida. I worked with a ballet company that is very dear to my heart, the Brandon Ballet. It's where I discovered my passion for dance photography and dancers. My time with the Brandon Ballet fostered a fire and love for growing as a dance photographer. And really, I don't know why I say "my time with" as if it's over, I still happy dance and squeal every year they ask me to come back and be a part of their season as their photographer. One day I was behind stage I was sitting with a dancer in between showings of The Nutcracker. The dancer was telling me about his life, his struggles and his dreams of being a dancer. As he continued to share, I thought to myself "This is amazing, this should be shared." I immediately thought of Humans of NY, a project I admire and enjoy following. My mind shifted to the idea of something similar but sharing the stories of dancers and their dance journey. It was then I realized that an idea had chosen me. So this is where I may start to sound crazy to you, but please stay around! I knew this idea had chosen me, but I also knew we would be moving to Richmond soon and I couldn't start such a project in Tampa. It would have to wait. I spoke to the idea, I begged it to believe in me and stay with me. I knew my heart wanted to create and bring it to life. I just knew it had to be the right time. In my first three months of moving to Richmond. I met a lovely friend named Shannon McConville. Shannon is the owner of Stavna Ballet Dance Studio and Artistic Director of Stavna Ballet Company. One warm September day I walked into STAVNA and introduced myself to Shannon and shared my desire to be considered as a potential photographer for her studio and company. I showed her my dance portfolio and a piece of my heart. We had an instant partnership and growing friendship AND as fate would allow it, it just so happened that Shannon's photographer had moved to New York just weeks before I walked into her studio. Shannon was the first local studio to say yes to my work and my passion to pursue dance photography full time. As we worked together more I told Shannon about my idea of working with dancers in the city and starting a project that could give dancers a platform to share their stories through a blog and social media. I would collaborate & photograph the dancers in a place dear to them in Richmond and then share those pictures to accompany their stories. My why: to inspire other dancers and to share inspiring stories that needed to have a voice. 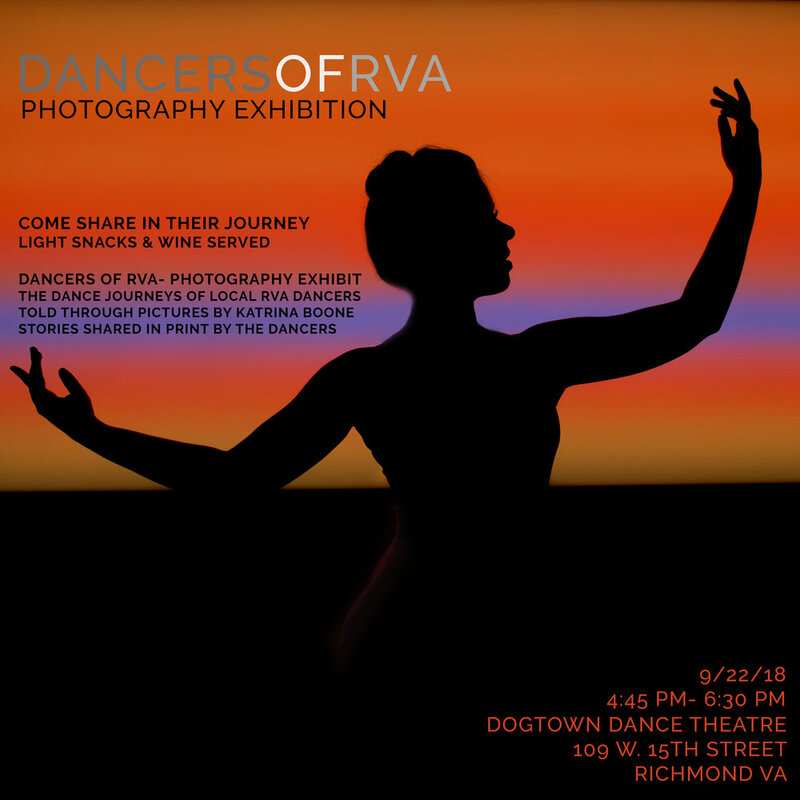 This idea soon had a name: Dancers of RVA and it soon had support and dancers to start the project thanks to one of my biggest cheerleaders, Shannon McConville. In June of 2017, Shannon offered to be my first dancer and shared her dance journey on our blog on June 26th, 2017, my first post MEET SHANNON! After Shannon's feature I worked with many other dancers from the STAVNA Ballet Dance Company and then like I had hoped, nominations started to come in! I started to work with other dancers and dance companies. I enjoyed getting to know more about the dancers and vast dance scene Richmond has to offer. I hope year one has started to show you just a few of the MANY talented dancers and dance companies that call RVA home! A year later, I have had the amazing opportunity to collaborate, photograph & featured 44 dancers sharing their personal dance journeys, in their own words, through our blog & social media! I stop frequently to thank that idea for sticking with me and choosing me. It has really been an honor to be a part of this project with all these amazing and inspiring dancers. Many have become friends and creative support beyond my wildest dreams. I am really a blessed gal! After taking a small break this summer, I am excited to return in the fall with new dancers and some new forms of dance we didn't feature last year! Any guesses? Would love to know what you'd like to see more of in year two! Thank you for following along this year. My greatest hope is you are inspired by these dancers and their dance journeys. It the stories that drive my creative heart and stir a passion in me that is hard to articulate. I hope my lens can explain it better than my words!